George Hrab has recorded an audio version of my story ‘The Peacock Cloak’ (a particular favourite of mine), here on Starship Sofa. Spectology have recorded not one but two very detailed discussions of Dark Eden. The ‘pre-read’ discussion is here. The ‘post-read’ discussion (i.e. the one in which spoilers are allowed) is here. They like the book a lot, which I’m obviously delighted about. Beneath the World, a Sea comes as an ebook and in hardback on April 4th. (1) April 6th, 1-2pm, I’ll be signing at Forbidden Planet, Burleigh St, Cambridge. 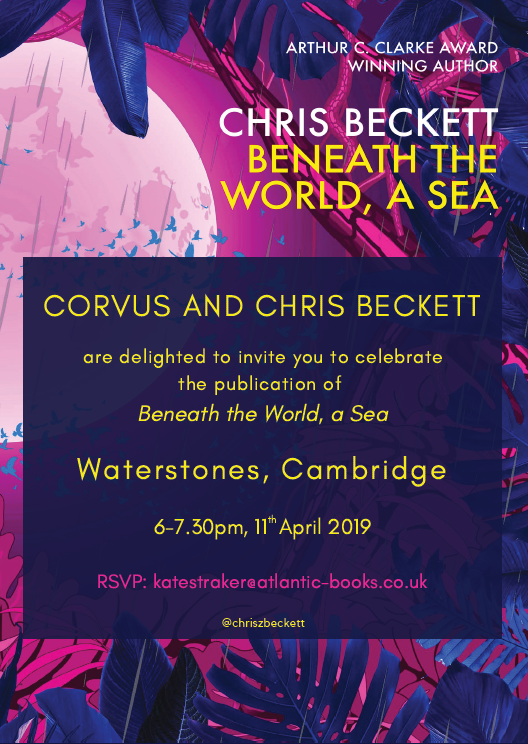 (2) April 9th, 7-9pm, at Waterstones, Norwich (follow link for ticket information), I’ll be talking about Beneath the World, a Sea, with the great Tony Ballantyne. The also great Imogen Church (who recorded the wonderful audio version of Daughter of Eden), will do a reading from the book. (3) April 11th, 6-7.30, at Waterstones, Cambridge, a launch celebration (please RSVP as per invite below). The whole of the island is covered with dense forests, mostly coniferous. The Yezo (or Yeddo) spruce (Picea jezoensis), the Sakhalin fir (Abies sachalinensis) and the Dahurian larch (Larix gmelinii) are the chief trees; on the upper parts of the mountains are the Siberian dwarf pine (Pinus pumila) and the Kurile bamboo (Sasa kurilensis). Birches, both Siberian silver birch (Betula platyphylla) and Erman’s birch (B. ermanii), poplar, elm, bird cherry (Prunus padus), Japanese yew (Taxus cuspidata), and several willows are mixed with the conifers; while farther south the maple, rowan and oak, as also the Japanese Panax ricinifolium, the Amur cork tree (Phellodendron amurense), the Spindle (Euonymus macropterus) and the vine (Vitis thunbergii) make their appearance. The underwoods abound in berry-bearing plants (e.g. cloudberry, cranberry, crowberry, red whortleberry), red-berried elder (Sambucus racemosa), wild raspberry, and Spiraea. Bears, foxes, otters, and sables are numerous, as are reindeer in the north, and musk deer, hares, squirrels, rats, and mice everywhere. The bird population is mostly the common east Siberian, but there are some endemic or near-endemic breeding species, notably the endangered Nordmann’s greenshank (Tringa guttifer) and the Sakhalin leaf warbler (Phylloscopus borealoides). The rivers swarm with fish, especially species of salmon (Oncorhynchus). Numerous whales visit the sea coast, including the critically endangered Western Pacific gray whale, for which the coast of Sakhalin is the only known feeding ground. Other endangered whale species known to occur in this area are the North Pacific right whale, the bowhead whale, and the beluga whale. I find it quite difficult to immerse myself in a novel these days and often have to make myself keep turning the pages. (I don’t know whether is this me getting more fussy as I grow older, or whether perhaps it’s the business of writing fiction that makes it harder: I imagine a puppeteer finds it hard to surrender to the illusion of a puppet show). But never mind all that because I did find this book immersive, and read the whole thing very quickly and greedily. This is a novel written by Adam Roberts, drawing on a film script and some notes by the late Anthony Burgess. I have to say that, in my opinion, the least successful parts of the book were the various interludes in the main action in the form of ‘news flashes’ and ‘camera’s eye’ views. In incorporating these, Roberts was being faithful to Burgess’ plan to make use of story-telling tricks invented by John Dos Passos. However I found them an unwanted distraction, and not really in keeping with the rest of the book, so that each time they came up I was impatient to get back to the main narrative. This, by contrast, I found entirely gripping. Edward the Black Prince was the son of King Edward III and would have have been Edward IV if he hadn’t died before his father. He is famous as a warrior, defeating French armies much larger than his own at the battles of Crecy and Poitiers, and as a kind of epitome of the chivalrous knight in armour. In fact, as this book shows, the wars he fought to expand and defend his father’s realms in France were incredibly bloody and brutal. In an age when ordinary people had absolutely no say in the decisions being made by their leaders, it was nevertheless considered perfectly acceptable, and perfectly consistent with the theological doctrine of ‘just war’, to hack to death the entire population of a town, including children and babies, if the leading figures in that town had chosen not to surrender promptly enough. (Since carpet bombing of cities remains a pretty standard weapon of war in modern times, I suppose we haven’t really changed in this respect. We just do our indiscriminate slaughtering from a sanitised distance which allows us to call it ‘collateral damage’). The savage and gleeful butchery involved, particularly at the sack of Limoges, is described by Roberts in remorseless detail. I was going to say harrowing detail, but that actually wouldn’t be entirely honest, because the truth is (and I’m not proud of this, but I’m guessing I’m not alone) that I actually find this stuff quite engrossing, and even exciting, to read about. The end result was that I emerged from the book disturbed not only by the events described, but by my own troublingly ambiguous response. Which is surely as it should be, because these things are not perpetrated by monsters but by human beings, drawing on the same instincts, desires and fears as the rest of us. 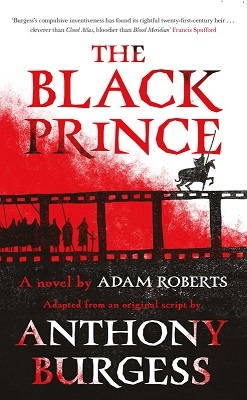 On this same theme, Roberts does a great job of conveying the humanity of the Black Prince and the other characters, as they move between ruthless slaughter and the ordinary emotions of everyday life. A professional mercenary for example, who fights and kills for plunder, grieves over his much-loved wife and regrets that he didn’t treat her better when she was alive. Occasionally characters feel some unease about what to us seem their most obvious sins, the industrial-scale killings in which they’ve been engaged, but they are human beings and have all kinds of defences and justifications that prevent them from worrying about these things for too long, much as we have defences, I suppose, that prevent us from worrying for any length of time about the exploitative sweat shops where people build the digital toys we play with, or the dangerous mines where the minerals for them are extracted. One strand that was particularly fascinating was the Black Prince’s preoccupation with the Holy Spirit, and what that meant. As I gather from other writings of his, Roberts is not a believer in the Christian religion but nevertheless finds Christian theology imaginatively engaging (a description that could be applied to me too and, from what I understand, also to Anthony Burgess). And it is by exploring this idea of the Holy Spirit that he lifts this book from being merely a grim catalogue of human cruelty into something more profound and even a little bit hopeful. As I say, I haven’t seen the movie and don’t know who Thanos is, but with a name like that I can tell he must be VERY BAD, and if he’s proposing genocide that is clearly VERY VERY BAD INDEED. No dispute there! But, unless I’ve completely misunderstood her, what the reviewer seems to saying (and she’s not the only one I’ve heard say it) is that the very idea that overpopulation is a problem is ‘hideous claptrap’ . I’m 63. I’m living on a planet whose population is over seven and a half billion, which is getting on for three times what it was when I was born. It’s a planet in the middle of one of the great mass extinction events of its history, a planet where the biomass of human domestic animals is now greater than that of all other animals of similar size, a planet where human activity has destabilised the climate itself and is threatening to acidify the ocean to a point that marine animals with shells may not be able to survive. And I personally am so far from seeing the idea of overpopulation as claptrap that I find it hard to imagine being inside a head that thinks it is. It seems I’m with Hollywood on this one. The idea that being concerned about population is ‘racist’ originates, as I understand it, from a time when people in wealthy countries expressed concern about the rapidly growing populations in developing countries without acknowledging that their own extravagant patterns of consumption were at least as much of a problem. I get that. But it would be pretty poor logic to take from that the idea that concern about overpopulation was necessarily racist per se. The fact is that all human behaviour impacts on the environment and the impact of any given human behaviour has to be multiplied by the number of people on the planet who behave in that way. A billion people driving cars X number of miles per year generates a billion times the amount of carbon dioxide as one person driving a car X miles per year. A billion people clearing forest to grow crops to eat will need a billion times as much forest as one person. Etcetera, etcetera. So, yes, population is only part of the story, but it is an indispensable part nevertheless. Say the human race were collectively to change its behaviour in such a way as to reduce the impact of every person on the planet by 50%. The population only has to double for the benefit of that change to be lost. 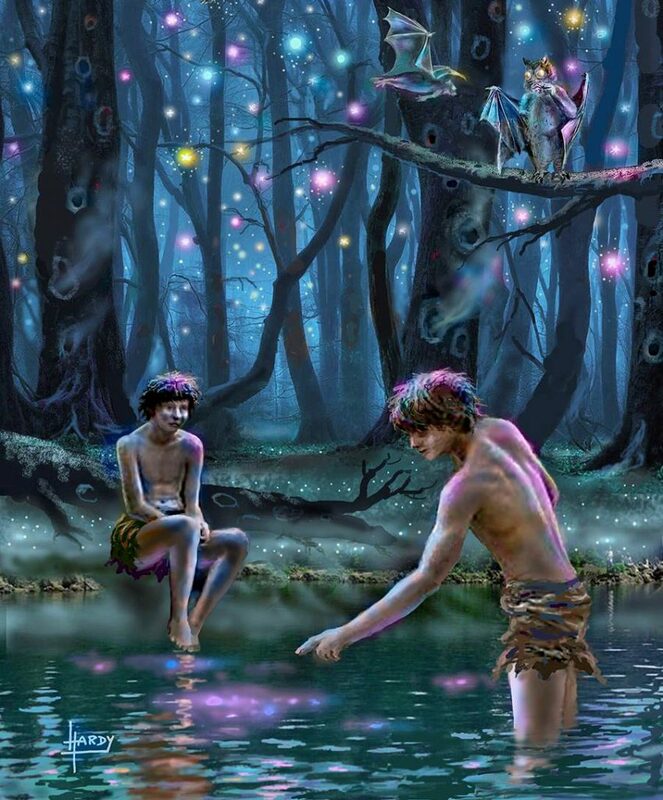 And since, however much the human population increases, the surface area of the planet remains unchanged, it must be the case that, for any given pattern of human behaviour, however frugal, there must be a physical limit to how many people the planet is able to support. Which takes me to the second charge made (in this particular film review but also elsewhere) against the idea that overpopulation is a problem. Not only is it racist, but it is Malthusian. The implied argument goes something like this: We know that Malthus was concerned about human population, right? We know that his predictions were wrong. We also know that some of what he said was pretty obnoxious. QED being concerned about overpopulation is ‘Malthusian’ and therefore both wrong and obnoxious. Right? Wrong! That’s not a logical argument at all. We are not living in the age of scholasticism, and arguments do not stand or fall on the authority of whatever famous name happens to have become associated with them. Calling someone a ‘Malthusian’ for being concerned about overpopulation, like calling them racist, is not an argument, it’s more like an exercise in denial. New interview here with Gareth Stevens. Includes my tips for would-be writers. New podcast interview here with Robin Shantz aka Bloginhood.